The Absecon Police Department is investigating a burglary the occurred at approximately 9:00 p.m. on August 22, 2014 at the Shore Points Pools store located at 921White Horse Pike. The suspect is seen on video prying open a side door and entering the building after cutting the phone and cable lines outside of the business. Once inside, the suspect cut additional lines and forced open a safe. An undetermined amount of cash was taken. The suspect appears to be a light skinned male, at least 5’-09 tall with facial hair. 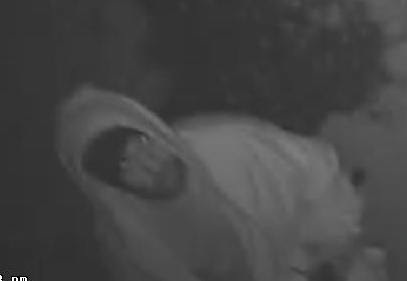 He appears to be wearing a light colored baggy hooded sweatshirt, light color pants and dark boots. The Detective Bureau continues to investigate and is examining additional evidence from the scene.